The nervous system comprises of two group of cells, glial cells and neurons. Neurons are responsible for sensing change and communicating with other neurons. Glial cells work to support, nourish, insulate neurons and remove waste products. This article will discuss the function of neurons and glial cells. Cell body or Soma – this contains the nucleus, the neuron’s intracellular organelles (such as the mitochondria and golgi apparatus) and it is the location for cellular metabolism. It is also contains the Nissl Substance. These are granules containing rough endoplasmic reticulum and free ribosomes, making it the site of protein synthesis. Dendrites – these originate from the soma and extend outwards. They transmit signals they receive from other neurons to the soma. 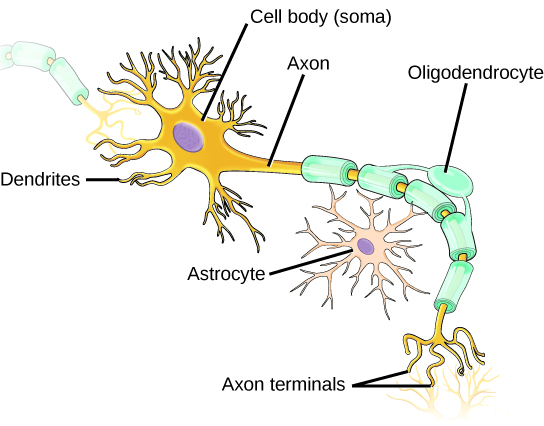 Axon – It arises from the soma from an area called the axon hillock, where action potentials are initiated. The action potentials are conducted through the axon to the axon terminal. Schwann cells – These insulate the axon which aids with rapid transmission of action potentials through the axon. 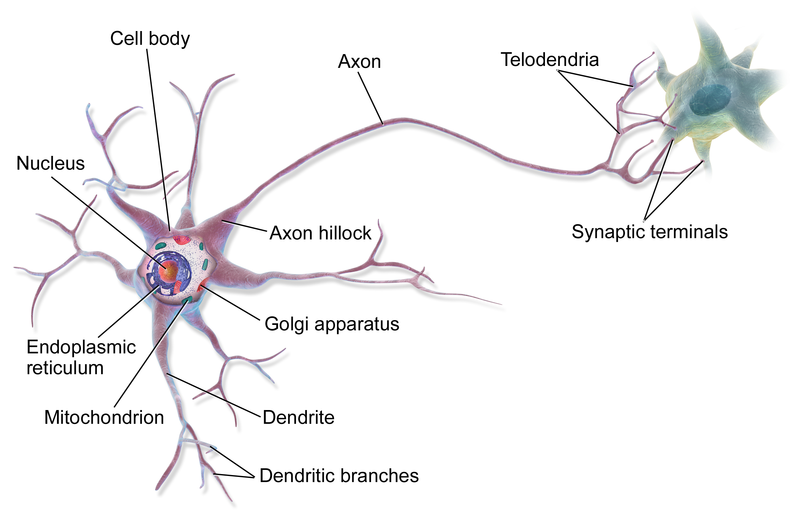 Axon terminal – Distally the axon branches to form axon terminals. These make synaptic connection with other neurons. They contain various neurotransmitters which is released into the synapse to allow signals to be transmitted from one neuron to the next. Providing metabolic support – The brain has a constant requirement for nutrients such glucose but they are unable to store or produce glycogen themselves. This is overcome by the fact that astrocytes store glycogen which can be broken down to glucose to provide fuel for neurons. Astrocytes can also store lactate which is useful as a fuel during periods of high energy consumption or ischaemia. Regulating the extracellular ionic environment – High-level of ions such as potassium can result in spontaneous depolarisation of the neuron. Astrocytes, thus, remove excess potassium ions from the extracellular space. Neurotransmitter uptake – Astrocytes contain specific transporters for several neurotransmitters such as glutamate. Rapid removal of neurotransmitters from the extracellular space is required for normal function of neurons. These cells are responsible for insulating the axons in the central nervous system. 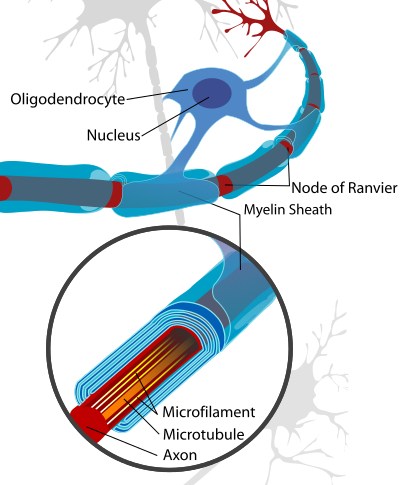 They carry out this function by producing a myelin sheath which wraps around a part of the axon. A single oligodendrocyte has the capacity to myelinate up to 50 axonal segments. They are equivalent to the Schwann cells in the peripheral nervous system. Further information on the myelin sheath can be found here. Microglial cells make up between 10 and 15% of cells within the brain and are of a mesodermal origin unlike the other glial cells which are of ectodermal origin. These cells are the phagocytic and immunocompetent cells of the nervous system. They are activated in response to tissue damage and have the capability to recognise foreign antigens and initiate phagocytosis to remove foreign material. If needed, microglia are also able to function as antigen presenting cells. The ependyma is the thin lining of the ventricular system of the brain and spinal cord. This lining is made up of ependymal cells, the basal membranes of which are attached to astrocytes. The main function of these cells is the production of cerebrospinal fluid (CSF) as a part of the choroid plexus. Their apical surfaces are covered with cilia and microvilli, which allow for the circulation and absorption of CSF respectively. Low grade astrocytomas are typically benign in nature, although grade II tumours have the potential to become malignant. Grade I astrocytomas are often found within the cerebellum and as such tend to present with symptoms relating to balance and coordination. Grade II tumours often present with seizures. High grade astrocytomas typically grow much more rapidly than low grade ones and are generally malignant in nature. Because of their invasive nature they are often difficult to remove completely surgically and frequently recur after treatment.